Welcome to the world of state-of-the-art technology and intelligent design solutions! Our RS3000R filters safely and effectively remove microorganisms like Giardia and Cryptosporidium from your water protecting you and your family from parasitic illnesses caused by these contaminants. The patented quick-change filter technology also improves the taste and overall quality of your water by reducing the amount of Lead, Chlorine, Asbestos and other impurities often found in water supplies. Warming and eliminating fats, chemicals and toxins from our blood & thus smoothening the flow of blood. The newly designed RS3000-R is user friendly with design simplicity in mind. It requires no tools for filter changes. Replacing the filters on this system is one of the easiest to do. Quick-change filter cartridges make cartridge replacement fast, clean & easy, without contact with used filter material . No tools required for replacements. 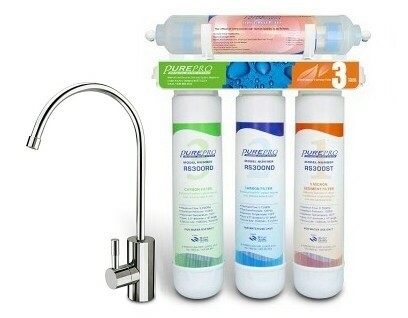 Complete 4 stage water filter system. Use twist and quick-change cartridge design makes filter changes fast, clean and easy. It takes out 99% of the chlorine and organic chemicals. It provides enhanced reduction of taste, and odor.